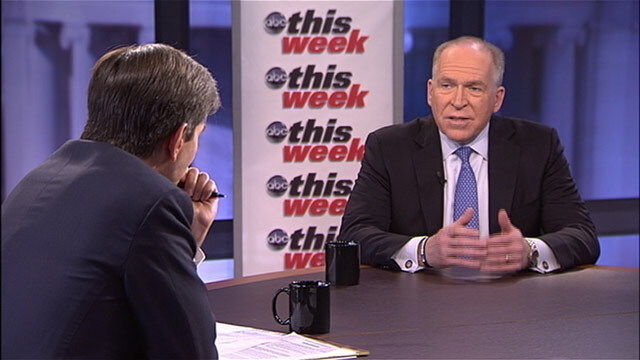 White House Counterterrorism Adviser John Brennan spoke to George Stephanopoulos on ABC's "This Week." OBAMA: Tonight, I can report to the American people, the United States has conducted an operation that killed Osama bin Laden, the leader of Al Qaida. OBAMA: Our businesses have added more than four million jobs over the past two years. STEPHANOPOULOS: Four years into the greatest recession of our lifetime, the recovery has begun. ROMNEY: This present has been anti-jobs, anti-investment, anti-growth. OBAMA: It's great to be here this evening in the vast, magnificent Hilton Ballroom for what Mitt Romney would call, "A little fixer-upper." STEPHANOPOULOS: It's Washington's prom night. KIMMEL: It's kind of hard to be funny with the President of the United States sitting right next to you looking at you. And yet somehow day in and day out, Joe Biden manages to do it. STEPHANOPOULOS: We've got all the jokes, the glitz and the glamour from last night's White House Correspondents Dinner. ANNOUNCER: From ABC News, This Week with George Stephanopoulos. It's your voice, your vote. Reporting from the Museum in Washington, D.C., George Stephanopoulos. STEPHANOPOULOS: Good morning. Much of official Washington may be sleeping in this morning after Capitol's Hollywood night, the White House Correspondents Dinner. Lindsay Lohan showed up on the red carpet. Kim Kardashian and George Clooney too. All for the chance to rub elbows with the cabinet secretaries, journalists and generals. This years standup duel, President Obama versus ABC's Jimmy Kimmel. KIMMEL: Mr. President, you remember -- remember when the country rallied around you in hopes of a better tomorrow? That was hilarious. OBAMA: Take Mitt Romney, He and I -- he and I actually have a lot in common. We also both have degrees from Harvard. I have one. He has two. What a snob. MEYERS: People don't think bin Laden is hiding in the Hindu Kush. But did you know that every day from 4:00 to 5:00 he hosts a show on CSPAN? STEPHANOPOULOS: ...this morning. So you know, we know that Al Qaida pays attention to anniversaries. And security has been beefed up, especially at airports. Is there any indication that an actual plot is in the works? BRENNAN: Well we are vigilant throughout the course of the year, but on a day that marks the one year anniversary of bin Laden being brought to justice, we are especially vigilant. At this time we don't see any active plot that is underway, but we are maintaining our guard. We are following every lead. There always are reports about Al Qaida trying to penetrate our defenses. But at this point, our counterterrorism professionals are doing their job, both here in the United States we well as abroad. STEPHANOPOULOS: But the FBI and Homeland Security this week did say that they believe the Al Qaida affiliate in Yemen is making new efforts to target western airports. STEPHANOPOULOS: Is it still focused on planes? BRENNAN: Yes. Aviation has been a target -- has been a traditional target of Al Qaida. They continue to do that. 09/11 obviously they used aircraft as weapons. So we need to maintain our vigilance, clearly overseas at these last points of departure and making sure that we're doing everything that we can to work with our -- our partners internationally to -- to protect the traveling public. STEPHANOPOULOS: Do they have the capability now to carry out anything like a 09/11 attack? BRENNAN: Their capability has been degraded significantly. We have taken off the battlefield the founding leader as well as other leading operatives. We have degraded their infrastructure. Their capability to train. Their capability to deploy operatives. So their capability has been degraded. Our defenses have increased. But that doesn't mean we can rest. And we're not going to rest until Al Qaida the organization is destroyed and is eliminated from areas in Afghanistan, Pakistan, Yemen, Africa and other areas. We're determined to do that. STEPHANOPOULOS: Can you say one year out how much difference killing bin Laden made? BRENNAN: I think it made a tremendous difference. It's taken away the founding leader of that organization who was symbolic -- a symbol of Al Qaida's sort of murderous agenda worldwide. And so, that has had I think a profound impact on the organization. And Mr. Zawahiri, who is his successor, is somebody who doesn't have the same sort of institutional support. He doesn't have the same charisma. STEPHANOPOULOS: But he has taken more control than we expected, hasn't he? BRENNAN: I think, you know, he's now at the top of the Al Qaida leadership structure. And this is something that we're determined to make sure that we're able to dismantle and destroy. So, clearly, Al Qaida has a number of different franchises worldwide. We've degraded them significantly with the help of our Pak (ph) and Afghan partners in that area, but there's a lot of work to be done yet in Yemen, as well as in areas of Africa. STEPHANOPOULOS: When Leon Panetta left the CIA to become the secretary of defense, he said that we're, quote, "within reach of strategically defeating Al Qaida." Is that victory at hand? BRENNAN: I don't look at it as a victory. I think, again, we have to destroy the organization. We have to take all of their operatives, their leaders, their training camps, take away their safe havens. And we're not going to rest. The president has made it very clear, we have to do everything possible to protect the American people, and the destruction of that organization is our ultimate goal. STEPHANOPOULOS: On Friday, President Obama's campaign released a video to mark the anniversary and suggested that Osama bin Laden might be alive today had Mitt Romney been president. BILL CLINTON, FORMER PRESIDENT OF THE UNITED STATES: He took the harder and the more honorable path. And the one that produced, in my opinion, the best result. WOLF BLITZER, CNN: It's not worth moving heaven and earth spending billions of dollars just trying to catch one person. He was referring to the hunt for Osama bin Laden. STEPHANOPOULOS: That drew, as you may know, a very sharp rebuke from Senator John McCain. Here is what he said. He said, "Shame on Barack Obama for diminishing the memory of September 11th and the killing of Osama bin Laden by turning into it a cheap political attack ad. He's doing a shameless end zone dance to help get himself reelected. No one disputes that the president deserves credit for ordering the raid, but to politicize it in this way is the height of hypocrisy." Your response? BRENNAN: I don't do politics. I don't do the campaign. I am not a Democrat or Republican. I'm a counter-terrorism adviser to the president. All that I know is that the president made the decision when he was given the opportunity to take a gutsy decision, to carry out that raid with our Special Forces in Abbottabad, Pakistan. The president made that decision. I think the American people are, you know, clearly very appreciative and supportive of that decision. We're safer today as a result. And, therefore, all I know is that the president made the decision when he had to. STEPHANOPOULOS: You said it was a gutsy call. Mitt Romney has said that any president would have made the same decision. Do you agree with that? BRENNAN: All I know is that the president made the call when he needed to. And as people have said, it was a divided room as far as, you know, some of the principal sentiments on this issue were concerned. STEPHANOPOULOS: It's been reported that the vice president, the secretary of defense, the secretary of state all against it, yet the president overrode them. BRENNAN: There was active discussion up until the last moment on this. And there were differences of view, clearly. But the president took all that counsel, looked at what the risks were, looked at the risk (ph) to forces, the chances for a successful mission, and decided that bin Laden's removal from the battlefield was critically important to this country, both in terms of making sure that justice was meted out for the deaths of thousands of not just Americans but also people worldwide. So he made the decision when he had to. STEPHANOPOULOS: You were right at the center, but what were you most worried about? BRENNAN: There were -- you know, what we didn't know. We had a certain perspective as far as what the Special Forces might encounter when they got to that compound, but we didn't know whether or not there were going to be tunnels as far as bin Laden's escape route, what type of explosives might have been rigged to that compound, what our Special Forces were going to confront, how they were going to get in there and out safely. So there were a number of the details of that operation that really left many of us very nervous and anxious about the ability to carry out the mission, get bin Laden, and then also get our forces out safely. STEPHANOPOULOS: This was a raid. Most of the attacks against Al Qaida over the last couple of years have been by unmanned drones. And they have decimated the top leadership. Are you concerned, though, that this is a technology that is now going to be exploited by our enemies? And do you stand by the statement you have made in the past that, as effective as they have been, they have not killed a single civilian? That seems hard to believe. BRENNAN: Well, what I said was that over a period of time before my public remarks that we had no information about a single civilian, a noncombatant being killed. Unfortunately, in war, there are casualties, including among the civilian population. We've done everything possible in Afghanistan and other areas to reduce any risk to that civilian population. Unfortunately, Al Qaida burrows within these areas, you know, safe havens as well as areas where there are civilians, but we've been very, very judicious in working with our partners to try to be surgical in terms of addressing those terrorist threats. And the president has told us, we want to make sure that we protect the American people. And unfortunately, sometimes you have to take life to save lives, and that's what we've been able to do to prevent these individual terrorists from carrying out their murderous attacks. STEPHANOPOULOS: John Brennan, thanks very much for your time this morning. STEPHANOPOULOS: And don't go anywhere. All-star economic panel is in the studio, right across the hall. We're back with them in just 60 seconds. BARACK OBAMA, PRESIDENT OF THE UNITED STATES: We can go back to an economy that's built on outsourcing and bad debt and phony financial problems. That's what we saw before 2008. Or we can fight for an economy that's built to last, built on American manufacturing and American energy and skills for American workers and the values that made this country great. MITT ROMNEY (R), PRESIDENTIAL CANDIDATE: What do we have to show for three-and-a-half years of President Obama? ROMNEY: Is it easier to make ends meet? ROMNEY: Is it easier to sell your home or buy a new one? ROMNEY: Have you saved what you needed for retirement? ROMNEY: Are you making more at your job? ROMNEY: Do you have a better chance to get a better job? GEORGE STEPHANOPOULOS, HOST: And we're back now at the Knight Studio at the Newseum to discuss the issue that, as you heard right there, is at the center of this presidential campaign and vital to America's future -- is this economic recovery built to last? Billing it as the challenge posed by President Obama at the State of the Union, it is being debated by the candidates right now. And today we're going to engage in that debate and try to dig beneath it to see what opportunities the country may be missing. Thanks to our partners at The Miller Center at the University of Virginia, we have assembled an all star panel of experts. To my right, as always, George Will; Carly Fiorina, former chairman of Hewlett Packard, also co-chair of Mitt Romney's presidential campaign in California; David Walker, former controller-general of the United States, CEO of the Comeback America Initiative and from what I read online, perhaps an Independent candidate for president this time around. To my left, Paul Krugman, Nobel Prize winning economist and "New York Times" columnist, also at Princeton University and author of a new book out tomorrow, "End This Depression Now"; Jennifer Granholm, former governor of Michigan, now host of "The War Room" on Current TV; and Eric Schmidt, executive chairman, former CEO of Google. Welcome to all of you. Welcome to our great audience here at the Knight Studio. And, George, let me begin with you, because we just saw some new growth numbers for the first quarter of -- of this year, 2.2 percent, kind of mediocre, giving fuel to some who say this is the worst economic recovery since the Depression. GEORGE WILL, CONSERVATIVE COLUMNIST: Yes, the question, I think, the threshold question is not is the re--- is the recovery built to last, but does it exist, in this sense. Would we be talking about a recovery if the unemployment rate were 10 percent? I ask that because the chairman of the New York Fed recently said that-- If workforce participation today were what it was when Obama was inaugurated, the unemployment rate would be well over 10 percent. We are now 50 months have passed and we're not nearly back to the pre-recession employment level. This is the longest string of consecutive months of 8 percent or more unemployment since the Depression, 5.5 million fewer people are working today than were working before the recession. The president recently boasted, he said, "We, in three months, have created 600,000 jobs." In the recovery from the Reagan-Volcker recession of the early '80s, in one month, there was more than 600,000 jobs created and in another month 700,000. PAUL KRUGMAN, ECONOMIST: That's right. STEPHANOPOULOS: -- has been worse than the one before. STEPHANOPOULOS: In the private sector. KRUGMAN: No, even in -- even in the aggregate. And -- and that is an important point. If you actually ask, what is different between the Obama economy and the Bush 2 economy, the answer is, actually, unprecedented reductions in government employment. Private jobs, the private job creation record under Obama is vastly better than it was under Bush 2, way better. So all -- private employment is almost back to where it was when Obama took office, whereas under -- under Bush, it was down more than two million at this point in his presidency. CARLY FIORINA: Well, I think we actually have three structural problems in the economy right now. The first is that we are destroying the entrepreneurial foundation of the nation. Right now, big companies are doing pretty well, because they have lots of global markets. But small business, more of them are failing and fewer are starting now than in the last 40 years. So if we don't restore small business, we're not going to have job creation. STEPHANOPOULOS: Can I pick up on that part of the that right now? STEPHANOPOULOS: Because she brings up two important points. Number one, in "The Wall Street Journal" this week, they -- they looked at 35 big multinational corporations and found that 75 percent of the jobs they were creating were overseas. I want to have you address that, but also the point on small businesses. A lot of your clients, your advertisers, are small businesses. Are you seeing them come back now? SCHMIDT: They are as they get online. The core issue, I think, about small businesses, half of them are still not even online. And the growth rate of businesses that are online is twice that than the ones that are offline. They actually are net job creators. Carly is right, we've got to get the small businesses growing. GRANHOLM: "The Wall Street Journal" also noted that in the first decade of this century, that those same businesses, the multinational businesses, cut 2.9 million jobs in this country, but grew 2.5 million overseas. So globalization certainly has benefited them. But it hasn't benefited us. And the question is, in this economic time, when we have a slow recovery, what are the policies that we can adopt that would grow jobs in the United States? Can we tie tax policy to growth in the United States? Can we look at what other countries are doing to be more active about planning and about inviting investment clusters, you name it? We just don't do any of that because it's wrong to intervene in the economy. KRUGMAN: I think that's actually a very misleading point, to look at this job creation overseas by -- and I'm not -- I'm not a big fan of giant multinationals, but the reason they're creating jobs abroad and not here is that -- that's an effect, not a cause. That's because other countries have been more successful at generating recovery. It's because China had an effective fiscal stimulus program and we did not. KRUGMAN: No, but that's -- that -- that was always going on. What's really distinctive here is that we've actually had effective recession fighting strategies in the developing world, but not in the advanced world. STEPHANOPOULOS: I -- I want to bring that question to David Walker, because one of the things we're seeing right now is you also learned this week that Great Britain -- this is not the developing world, but Great Britain slipped back into recession. It raises this whole question, Great Britain, other European nations cut back severely. You're saying we have to deal with our debt. But how do we balance the need to deal with the long-term debt and to get growth right now? DAVID WALKER: We have two issues. We have a short-term challenge and we have a structural challenge. And we need to recognize the difference. You don't want to have significant cuts or significant tax increases in the short-term because we have a weak economic recovery, we have high unemployment and higher underemployment. At the same point in time, we have a number of structural problems. Our fiscal policy, tax and spending; our education policy; our infrastructure policy; our basic research policy -- you know, they are unsustainable at the present time. STEPHANOPOULOS: Those are the long-term issues. I want to get to more of those later. STEPHANOPOULOS: -- are the most important, what are the big X factors in the economy that you're keeping an eye on. WILL: Well, what the economists call an exogenous factor, which is a sort of meteor from elsewhere. You have Spain. You have Europe. You have the problems that -- that Paul Krugman calls "the bond vigilantes" might actually exist. He doesn't think they do at the moment. KRUGMAN: Not for any country with its own currency. WILL: That's right. But the -- which rules out the Spaniards. So something like that could happen. But what we have -- what is hard to answer is the question, what's different now? We've had 11 recessions since the Second World War. Even with 11 recessions, the average growth rate since the Second World War was 3.3 percent. When we're not in recession, it's been 4 percent. Why are we at, as you just said, 2.2 percent? WILL: What we are doing differently? KRUGMAN: But we know the answer to that. KRUGMAN: This -- this one was brought on by the worst financial crisis since the 1930s. And there's overwhelming evidence that the aftermath of a financial crisis is different. It's not like the -- the Reagan recession, where it was imposed by the Federal Reserve, which pulled on the economy, basically imposed a recession to bring inflation down and then let it rip again as soon as that was past. KRUGMAN: This is one where the -- we're trying to overcome the overhang of debt, the overhang of housing that -- that's never going to be sold, that was left by the bubble of the middle of the last decade. FIORINA: But we're also trying to overcome something else. And I think it gets to Jennifer's point. I said there were three structural issues in the economy. One is small business. There are two others. The rest of the world has also changed. And the two other structural problems in our economy are we now have the single highest business tax rate in the world. Guess what? With the highest tax rate in the world, we see the same thing around the world that we see in states -- states with lower tax rates have more jobs, more people. People leave states with higher tax rates. The data is crystal clear. But the second -- the third structural problem we have is our education system. Our education system is not keeping up. And so if you talk to people in Silicon Valley, where Eric Schmidt comes from, they'll say we've got jobs and we have a really hard time finding people. We now know, the data is clear, that the quality of our education system is slipping. The quantity of education that we give our children is slipping. FIORINA: -- a robust recovery. KRUGMAN: Nothing you said about business taxes is actually true. FIORINA: This isn't an academic discussion. It's clear it's true. KRUGMAN: If you look at the actual tax collections in the United States on business, they're lower than -- than other advanced countries. And if you look at the alleged finding that high business taxes cause job losses in states, it -- it goes away -- on even the kick the tires, even slightly and the whole thing falls apart. It's just not true. GRANHOLM: Well, and let me just say, too, I mean governors can chase one another around the country in terms of offering tax incentives and low rates, but it's a terrible national economic strategy. You are just moving the deck chairs around on the Titanic. The question is, as a nation, what we are doing to compete, to get those jobs in this country? STEPHANOPOULOS: -- question to Eric Schmidt, because in -- and Carly raised the point, as well. How bad is that mismatch between the skills you need in Google and the workers you see? SCHMIDT: It is huge. Our industry is growing ra -- rapidly. We are unable to hire the technically trained people we need. There are shortages not just in my industry, but in many technical industries. There are shortages of sophisticated manufacturing engineers in America because the sum of our educational system is not producing enough. If I go back to the question of why is this recession different, there's at least two good reasons. One is the -- the ever-present nature of globalization is now much stronger, so it makes everybody more competitive. And also because of advances in automation are making it less needy to hire more people. STEPHANOPOULOS: And we're going to have to take a break right there because we do want to come back and talk about what to do about all that. You heard a lot of analysis here. Lots of definitions of the challenge. When we come back, the solutions. STEPHANOPOULOS: Lots more to come from our all-star panel from right here at the Newseum after this from our ABC stations. BARACK OBAMA, PRESIDENT OF THE UNITED STATES: This Congressional Republican budget is something different altogether. It is a Trojan Horse. Disguised as deficit reduction plans, it is really an attempt to impose a radical vision on our country. It is thinly-veiled social Darwinism. MITT ROMNEY (R), PRESIDENTIAL CANDIDATE: In Barack Obama's government-centered society, government spending will always increase because there's no reason for it not to. There's always someone who's entitled to something more and who will vote for anyone who will promise them something more. STEPHANOPOULOS: You're going to be hearing a lot more of that from the two candidates this year. We want to talk about it now with our all-star panel, and David Walker, former Controller General, let me bring this to you, because you find both parties budget solutions wanting. WALKER: Right. The Republicans don't believe -- they believe we can solve our problem without more taxes. They're not right. They believe we can solve our problem without cutting defense spending. They're not right about that, either. The Democrats for the most part don't want to renegotiate the social insurance contract, and they think that the Affordable Care Act will save us money. Not right. The chief actuary of Medicare estimates the cost of that bill will be $12 trillion higher than the politicians claim. So, the truth is, we have to recognize reality. STEPHANOPOULOS: What does he get wrong about the Democrats? GRANHOLM: Well, first of all, the Congressional Budget Office has said that compared to the way the situation was, this does bend the cost curve down in terms of the Health Care Act, but clearly there needs to be more to be done. The question really is, is all this cutting on the Republican side -- and not one dime of revenue -- is that the solution that's going to create jobs? Isn't that what the economy is all about? And as you said, that's not the thing. But if Mitt Romney and the Republicans only want to do what we did under George Bush, we have seen the results of that. We don't want to go backwards. We've got to be more active. GRANHOLM: In tax cuts, right. GRANHOLM: If you're looking at the Ryan budget, yes. KRUGMAN: -- if you look at what's actually in there, it's going to blow up the deficit, not shrink it. STEPHANOPOULOS: -- those exemptions gone. FIORINA: Yes. Close the loopholes. And three, simplify it dramatically. Why? Because our tax code, like our regulatory regime, has been written by big business, big labor, and big government. Simplify it. And if we have to carve out something special for big business, fine, to regulate them more carefully than the small business. But we have to restore the entrepreneurial foundation of this nation. It is what creates jobs. WILL: The fact is -- when Reagan and Rostenkowski and the others simplified the tax cuts in 1986, since then, the tax code has been re-complicated more than once a day, seven days a week, 365 days a year. Wouldn't it be nice to have a tax code that looks like someone designed it on purpose? Instead it is exactly as Carly described, it's a favor machine, much more than the appropriations committee in the Congress. GRANHOLM: And yet neither side disagrees that there needs to be simplification. GRANHOLM: I don't think people disagree on that. That, I think, you've got a lot of language on both sides of the aisle people want to do that. Can they do it in this election year? No. Is that going to be the way the recovery happens, is just the restructuring of the tax code, when you don't do the investments that are necessary for education. FIORINA: It's necessary but not sufficient. GEORGE STEPHANOPOULOS: Let me ask Eric Schmidt, because you talked to the president, you've advised the president on this. And he has hinted that if he were to get a second term, he would want broad based tax reform as well. What would you tell him to do? ERIC SCHMIDT: Well, the first thing, the administration has certainly been looking at the question of corporate taxes, and I know that because I've heard some of it. To me the core question -- of -- most of the tax decisions are essentially political. Whether rich people get hit by higher taxes or not, it's not really going to solve the problem. STEPHANOPOULOS: You're not going to avoid that. SCHMIDT: No. But the -- the fact of it is that he's right. That the numbers don't add. And you've got to come up with something where the sum adds. We have to come up with some way to reduce the forward expenses and get growth rate happening. STEPHANOPOULOS: What I hear when you say that is that if you're a working American making $50,000 to $60,000 a year, taxes are going to go up? WALKER: Between capital gains, dividends and ordinary income and we will accomplish multiple objectives in a prudent and sustainable manner. WILL: It is my duty to be the wet blanket at movable feasts such as this. WILL: Let me tell you why none of this is going to happen. The three really big ways to recoup money by closing loopholes are mortgage interest deductions, taxation of employer provided health insurance and deductibility of state and local taxes. None of those will happen. There is such a thing as a system, such as our tax system, that is so complex that it is permanently un-reformable. Because when you undertake broad-based reform, you're picking up one point with every American, but six points with every American. STEPHANOPOULOS: George, I basically agree with you. Let me play devil's advocate for a second. Because we are facing this cliff at the end of the year when the tax cuts that were passed under President Bush will expire, which becomes a big lever to force some kind of action. If Congress has to act, doesn't major -- isn't it, as Donald Rumsfeld would say, enlarging the problem, would be a better way to deal with it then go for a whole hog reform? WILL: That's right. It is arguable. And history supports it that democracies act under difficult problems, under the lash of necessity. The British listened to Churchill but didn't heed Churchill all through the '30s. In the middle of May, Churchill got to the channel ports and they said, oh, let's listen to Churchill. I don't know what the analogy is of Hitler being at the channel ports, but we're probably getting close. WALKER: We're number 28 out of 34 countries in the world in fiscal sustainability. On rankings we're worse than Spain. We're worse than Italy when you look at total government debt, which is federal, state and local. Look, we can turn this around. But my view is, it's absolutely imperative that we make meaningful progress by no later than the end of 2013. FIORINA: So let's just stipulate that everybody at this table, and the vast majority of politicians, are interested in creating as many jobs as possible and raising as many people out of poverty as possible. The data from the real world is crystal clear and all you have to do is go to our home state of California. California used to be the most vibrant economy in the world. And what is it today? It is an economy with yawning budget deficits, deteriorating public services, double digit unemployment. And what's happening in California? People are leaving. GRANHOLM: Let me put Michigan on the table as a counter example. Michigan had the toughest economy in the nation for the first decade of this past year because of the loss of automotive and manufacturing jobs. There was a decision by the Obama administration to intervene. At that point, we had hit bottom. Our unemployment rate was 14.5 percent. It's now 8.4. It's the second quickest -- the second fastest drop of any state in the country. But the reason is, because there was a decision made to intervene, to save that industry, put it on solid ground. They had great management. There was a decision made to intervene to allow us to diversify the economy. And as a result, Michigan is now seeing a recovery. The hands-off strategy would not be working. FIORINA: That's not what I'm advocating. I'm not advocating a hands-off strategy at all. Invest in the industries that matter through basic research. Fundamental reform the tax code. Do everything necessary to get small business going. Take on the structural educational problems. Do some of the things that we're talking -- that's not hands-off. WALKER: The problems is we're doing nothing now. FIORINA: It's not government stimulus. SCHMIDT: This perpetual argument over taxes is simply a lever to try to do the right thing. It's obvious what the right thing is. And we end up talking about the wrong thing. The right thing is to get people employed in jobs that matter. SCHMIDT: And how do you do that? It's done largely by the private sector, largely with intelligent regulation and not too much of it. Let's figure out a way to get people being hired by business that solve problems. It will happen. SCHMIDT: Well, surely you're not arguing that the government should hire all the unemployed people? SCHMIDT: That number won't fix the problem I'm talking about. If you look at forward growth in our citizen rate, they will be hired by private businesses, primarily small businesses. FIORINA: Look at the unemployment among young people. KRUGMAN: The most important thing right now is to end the depression we're in. GRANHOLM: Isn't' that what the Recovery Act is? SCHMIDT: It was. But if you look at the Recovery Act, which I supported, much of that went to stuff which is now structurally part of the base. STEPHANOPOULOS: Was the Recovery Act the only thing -- Carly, I want to bring this to you -- was also the extraordinary action both administrations took in the end on helping the auto industry. We're seeing all these blockbuster numbers coming out of Chrysler, coming out of GM. Isn't this a case, in extraordinary times demand extraordinary measures? FIORINA: So I did not support the bailout of General Motors. I think President Bush made a mistake. And I said so publicly at the time. I have never understood the logic of it, frankly. Ford Motor is doing better than either General Motors or Chrysler. They were not bailed out. And, frankly, we now are subsidizing products from General Motors, like the Volt, which are not competitive, which are not priced competitively. So of course we need an automotive industry in this nation. STEPHANOPOULUS: How do we respond to both of them? GRANHOLM: Of course we need an automotive industry in this nation. GRANHOLM: But it happened in the midst of a collapse. There were -- there was no debtor in possession. Nobody would be willing to stand up to put money into it. The government was the debtor in possession of the last resort. We would have no auto industry. KRUGMAN: Wall Street banks were in trouble too at the moment. FIORINA: Yes, they were. Yes, they were in trouble. KRUGMAN: Think -- think about what the world was like at the end of 2008. FIORINA: Yes, they were in trouble. Absolutely they were in trouble. WALKER: I think you can make an argument that the auto industry needed to be helped, but how you do it matters. FIORINA: Yes, the question is how. WALKER: OK, how you do it matters. FIORINA: The question is how. FIORINA: Absolutely, they were in trouble. FIORINA: Yes, the question is how? WALKER: -- how you do it matters. STEPHANOPOULOS: But it worked, didn't it? WALKER: -- doesn't mean it was right. FIORINA: How well did it work? WALKER: -- that were totally inappropriate. GRANHOLM: This was a phenomenal success. FIORINA: I don't think so. GRANHOM: It was a phenomenal success. WALKER: It could have been better. GRANHOLM: A million jobs were saved. GRANHOLM: How can you say that it was done wrong? WALKER: -- we should have done something. What we did was not the right thing to do. WILL: I was on an airline the other day. And as we pulled up to the gate, the flight attendant came on and said, "We thank you for flying Delta," I think it was. "We know you have your choice of bankrupt airlines." WALKER: They wouldn't have disappeared. WILL: -- they wouldn't have disappeared. They'd have been reorganized differently. WILL: But, look, it's difficult to stop the American people from creating wealth. It's hard to do that, such is the animal spirit that is natural to this country. WILL: -- there's a character in Hemingway's novel, "The Sun Also Rises" who's asked how did I go bankrupt? WILL: The American people are convinced -- Paul's not. Some people are, some people are some people aren't, I am, that we are approaching the sudden stage. STEPHANOPOULOS: We've talked about how to create jobs. We've talked about how to create wealth. There is also the question of where the wealth goes. STEPHANOPOULOS: And we know this whole debate about income inequality is going to be at the center of this campaign, as well. Take a look at this. OBAMA: What drags our entire economy down is when the benefits of economic growth and productivity go only to the few and the gap between those at the very, very top and everybody else keeps growing wider and wider and wider and wider. ROMNEY: The country already has a leader who divides us with the bitter politics of envy. We have to offer an alternative vision where we're lifted up by our desire to succeed, not dragged down by our resentment of success. STEPHANOPOULOS: -- how worried should we be about inequality? SCHMIDT: Well, if you looked at it over the last couple of decades, the rate of inequality has increased dramatically. And it's particularly concentrated around the difference between college educated and not. From my perspective, there's a -- a fairness argument. And I personally believe that the top 1 percent need to share more. And they can share that in many, many ways, including philanthropy. But the fact of the matter is that we have to have a -- a growing middle class and we have to also worry about this generation that's currently unemployed that are in their '20s. One of the things we haven't talked about is youth unemployment in -- in America is very, very bad. In their 20s, 25 percent, depending on which surveys. SCHMIDT: -- is a pernicious price of our system. It's very, very bad long-term. KRUGMAN: But that's a -- and, by the way, that's, again, why this notion that we need to work on the long run and short run job creation measures are -- are not serious, which is -- pervades our discussion, is all wrong. Because by not having enough jobs in the economy right now, by not doing stimulus, by not ending this depression, we are condemning a lot of recent college graduates to not getting a job that makes use of their skills. SCHMIDT: The thing is, also, like over a five year period, eventually, you don't have a job, then you have various health problems, then you have lifestyle problems, and then you're sort of priced out of the market. WALKER: George, there is absolutely no question that there are growing gaps between the haves and the have-nots in the United States and around the world -- income, wealth and skills and knowledge. WALKER: You know, the -- the escalating cost of college education. Our immigration policy makes no sense whatsoever with regard to competitiveness. WILL: There is widening inequality of income. That's a bad thing. But there's a good aspect of this. It's the market sending a price signal. The market is recording radically increased returns on education, which means the market is saying, at the top of its considerable lungs, stay in school. Schools have to be worth staying in. WILL: I mean we -- just to take one example, K through 12 education. We have the shortest school year in the industrial world. WILL: We have a school year designed in the late 19th century for a ranching and farming nation when the children are needed on the ranches and farms in the late spring and early fall that's of limited relevance in Detroit today. WILL: We ought to be in school at least another month a year. STEPHANOPOULOS: We're just about out of time. I want to get to one other big issue before we break. And, David, I'm going to start this one with you. We learned from the trustees of Social Security and Medicare this week that both programs are in a little worse shape than they were before we knew. And -- and -- and we all know that they are driving the long-term -- Medicare especially -- the long-term costs at this government. How much worse is it right now? And what is your short solution? WALKER: Well, first, Social Security does not face an immediate crisis. It is paying out more than it's taking in. But it's the greatest opportunity to reform a social insurance program and exceed expectations. The truth is, they said that the unfunded obligations for Social Security and Medicare went up $4.8 trillion in one year. And every year that we continue to do nothing, it's a problem. We don't have three things that any enterprise needs. We don't have a strategic plan. We don't have a budget. And we don't have performance metrics. So we're going nowhere fast until we get those three things. KRUGMAN: By the way, the Social Security -- the -- the trustees' reports, what they basically said is this lousy economy is -- is wreaking hell with our finances. It was not -- it was not really a statement about the programs. It -- it all -- all of the sort of definable changes that were taking place are a result of the lousy state of the economy. So it, in a way, it's -- it's what I've been saying, that a large part of the solution, not all of the solution, but a large part of the solution to our -- budget problems is to actually generate an economic recovery. WILL: -- is simple. I mean the average length of retirement in the 20th century expanded from two years to 20 years. The system was never designed for this. If we had indexed the retirement age to life expectancy in 1935, the retirement age today would be 74 and we'd have no problem. WILL: Instead, we have a majority of Americans taking Social Security at 62, which is absurd. KRUGMAN: The life expectancy has risen for upper income Americans, not for lower income Americans. So that's one of those things. So index it to the average life expectancy. Life expectancy at the age of 65 has gone up substantially for the upper half of the income distribution, but not for the lower half of the income distribution, which is -- which is who are the people who really depend on Social Security. Which gets to the reason why income inequality is also central to all these problems. STEPHANOPOULOS: Let me end by raising a question that's on the minds of a lot of Americans this election year especially. We're seeing it in all of the polls, basically, this year. A majority of Americans -- and the number is increasing -- believing that the country we had, the country that they have grown up in, is not going to be the same country that their kids grow up in. What do you say to that? SCHMIDT: There's a great opportunity to fix this. We're going to have an -- a political election. We're going to have a lame duck session. Let's get the lame duck session to at least settle some of this so that people have enough certainty as to what tax policy will be. Businesses can invest, how education is going to work, so we can go about doing what's great about America. America is extraordinarily innovative. Eighteen of the top 20 world's universities are American. The model of research, the model of new technology and so forth, will drive America forward. It is actually possible, but only if we take the steps necessary to do it. GRANHOLM: I'm always optimistic in the face of an election. And I think citizens should look at those who are in Congress or who are anyway and who signed pledges promising never to compromise, because those are the people you want to throw out. I think that we have to occupy the majority with people who will be reasonable, compromise and have a plan for job growth in the United States. WILL: That being so, it's important to remember, we're not Bangladesh. We can get well by choosing to get well, by having smarter policies. Again, it -- it's a question -- the country is seething with talent and energy. It's a rich country, educated, industrious population, continental market. Everything is going for us once we get our bad policies out of the way. FIORINA: I think we need to remember a couple of fundamentals. For all of our conversation about entitlement reform, which is absolutely necessary, entitlements do not lift people out of poverty, jobs do. So we have to remember what is it that creates jobs. And the data actually is very clear, no matter how much Paul or others want to continue to bang on government stimulus, government stimulus does not create wealth or jobs in the long-term. There's only one things that does that -- a rising level of education, a strong entrepreneurial foundation and a tax and regulatory structure that encourages people to take a risk, invest capital and create a business. WALKER: America is a great country, but we've strayed from the principles and values that made us great. We're not discharging our stewardship responsibility. We're -- we're approaching a critical crossroads. Our political system is broken. We have a republic that is not representative of or responsive to the public. We need to make meaningful progress in 2013 because we are not exempt from the laws of prudent finance. STEPHANOPOULOS: Jumping ahead to the election, but that was a fantastic discussion. Thank you all very much. Thanks for our audience here in the Newseum and at The Miller Center at the University of Virginia. And you can -- we're going to have the whole discussion online at ABCNews.com/thisweek and on The Miller Center Web site, millercenter.org. We're going to be back with all the great lines from last night's White House Correspondents Dinner. But first, we remember and honor our fellow Americans who serve and sacrifice.